Physical therapists, occupational therapists, certified athletic trainers, chiropractors, physicians, nurses, physiotherapists, and professional athletes are among those using kinetic Tape. This elastic tape can stretch up to 30% or 40% of it’s length and is said to have beneficial effects on several body systems including, circulatory/lymphatic, neural, muscular, and fascial as well as joints. One of the ways it helps is to lift the upper layers of skin from the muscle relieving pressure on the pain receptors and allowing for better flow of the lymphatic system, blood and lactic acid. All of this works to allow the body to have a more normal response to injury and “removes some of the roadblocks that normally slow down the healing process.” Kinetic tape can also help to correct alignment of weak muscles and through the recoiling of the elastic can facilitate joint motion. While kinetic tape is awesome, NIKKEN’s Kenkotherm DUK Tape is even more awesome! NIKKEN took all the amazing qualities of regular Kinetic Tape and gave it superpowers by adding the far-infrared and negative-ion technology. 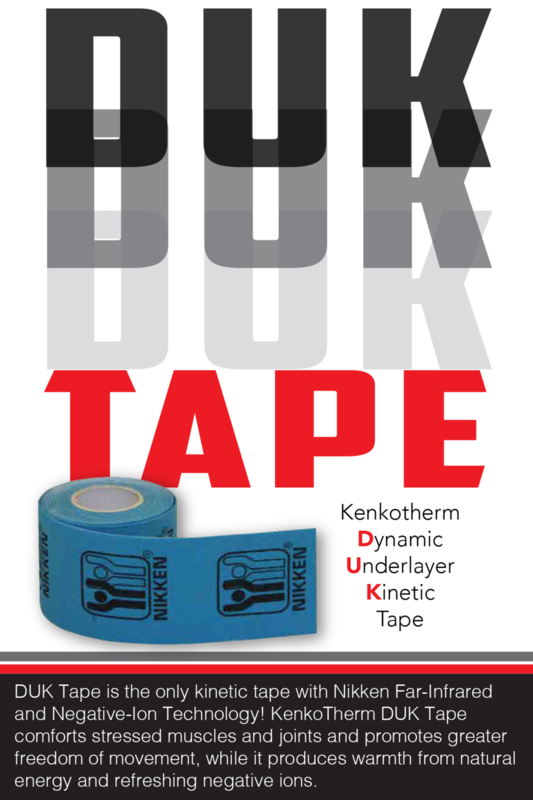 The Kenkotherm DUK Tape comforts stressed muscles and joints and promotes greater freedom of movement while it produces warmth from natural energy and refreshing negative ions. There are many websites devoted to showing you how to properly apply kinetic tape. Two of our favorites are www.rocktape.com and www.spidertech.com/. Our own Jen Bessire, a physical therapist for 20 years with a PhD in Kinesiology, did a presentation on how great NIKKEN’s DUK tape is and she does some demonstrations on how to properly use it. This was a fantastic presentation and can be viewed on YouTube at https://www.youtube.com/watch?v=eXCmFW88My8. During the product launch in Salt Lake City, I was able to interview people who had used the new DUK Tape and their experiences were amazing. You can watch some of those testimonials here https://www.youtube.com/watch?v=R6rFXWwv6cY. This tape is incredible and has the potential to open so many more doors for NIKKEN’s consultants. Talk to your physical therapist, your doctor, your chiropractor, your personal trainer and tell them about NIKKEN’s Dynamic Underlayer Kinetic Tape. It’s a great way to introduce NIKKEN and all of their other amazing products. Here are some flyers for you to print to introduce the DUK Tape to people. On the back are instructions for use, a QR code that takes you to this blog post and a space to write your consultant contact information. The flyer is a 4" by 6" design.